This page is dedicated to the first 6 issues of the Hulk. You will find details about each and every issue here that formed the green/grey Goliath for the next 50 or so years. I bust out some of the best tidbits from each comic and the credits to each so that you can say that you know something about the Hulk, that you didn’t before, after leaving this page. Best Line: “Are you kiddin’? What do you think he is… the Hulk?” Rick Jones in response to an army soldier who was asking Bruce Banner if he was mixed up in this mess. Key Moment: 1st time Rick Jones locks the Hulk in the concrete cell under the sea. Best Line: “What’s that?? An Invasion? An armada of spaceships! Where? How? Keep calm, man! Sound the red alert! I’m on my way!” – Thunderbolt Ross after getting the report that there in an armada of spaceships about to attack. Hulk Transformation: Triggered by Sunset/Sunrise but then, after being shot into space and after being exposed to mysterious, powerful rays of radiation, Hulk is no longer affected by the sun and remains unchanged for the rest of the issue. Best Line: “Bend down now, Hulk! I need a lift down the mountain. 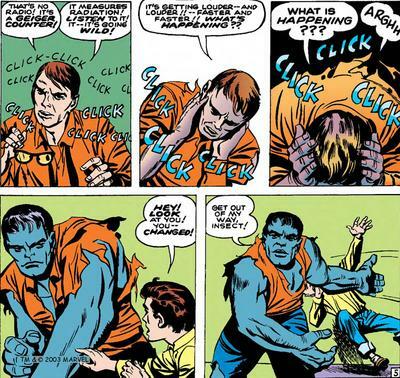 That’s it — bend –” – Rick Jones taking advantage of the Hulk. Key Moment: Hulk uses “Thunderclap” for the first time; Bruce Banner triggers his own transformation into the Hulk; 2nd time Hulk is referred to as an “Engine of Destruction”; Ross creates an Iceberg Rocket. Best Lines: “Rick, you wonderful, loyal, empty-headed kid! I did it! The ray works! 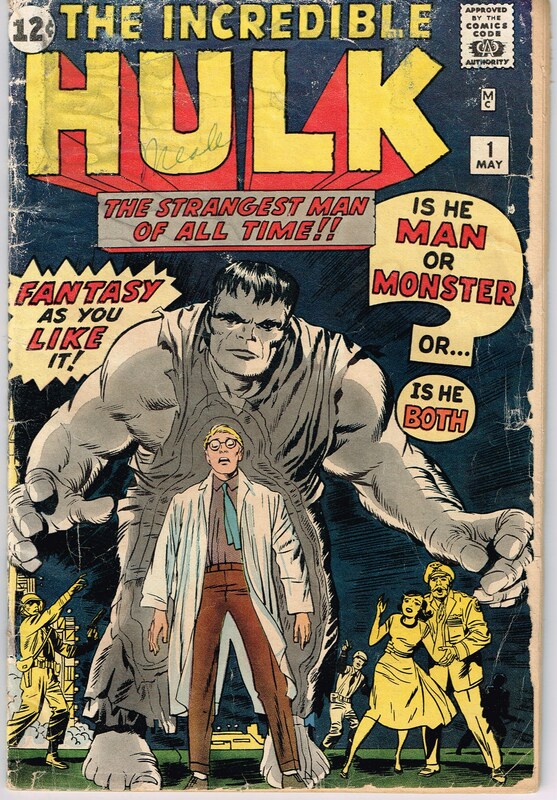 I have the Hulk’s strength–but I can still think like Bruce Banner!” – Hulk giving Rick Jones a back-handed compliment; “I’m leavin’ ya now… but if you’re not on the way back to Vodka-Land by the time I hit Earth, I’ll be back! 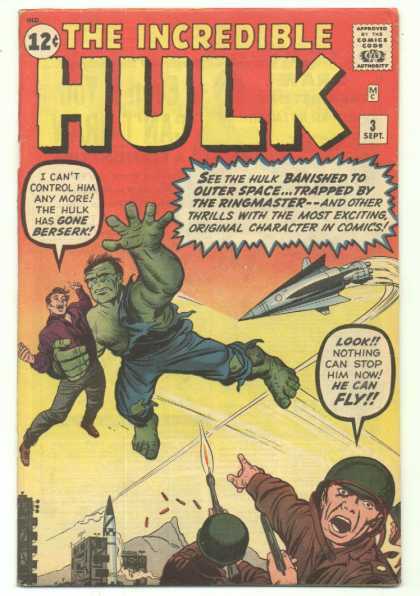 And I won’t be so easy on you next time!” – Hulk’s threats against the Russian Army. Lee Loves Cardboard: “Just like I figured! Nothing but cardboard and cork! The whole thing is a phony!” ~ Hulk finding out Mongu is a fake. Best Line: “Hey! Watch out with that hot coffee, ya Lame Brain!” ~ Hulk complimenting an Airline stewardess on her service. Banner has actually cured himself from the Hulk a few times during the Hulk run. Incredible Hulk #141 (which is the first appearence of Dr. Samson) has Samson curing the Hulk only to have Banner “re-infect” himself to take the focus of Betty Ross off Samson and back on him. Also, Bruce and the Hulk were seperated and then later the Hulk dissapeared all together after the events of #324 (2nd appearence of the Grey Hulk). 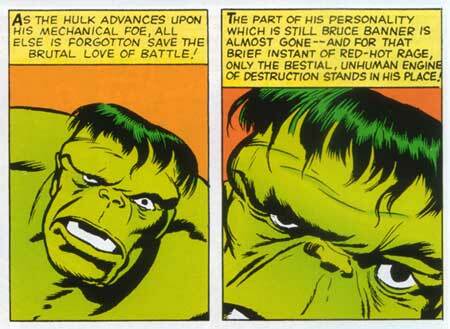 During John Byrne’s run Bruce Banner was completely seperated from the Hulk. And Lastly, when Peter David took over the writing – Banner was still Hulk free but, tricked by the Leader, he used his Gamma Gun (last seen in the original 6 comics) to “re-infect” himself and once again bring out the Grey Hulk to try to stop the Rick Jones Hulk. Hulk has been blue twice. Once when given the ability to breathe underwater and the other when given Captain Universe’s Power. Ahh…*Farts* I remember when I first Read These!They WERE great STILL ARE great AND ALWAYS WILL BE great! How did you get the first comics?!!? Ive been looking for them EVERYWHERE! Any idea what the print runs were on the first six? Or of how many are still out there? That part of the intrigue with the Silver-age books. No one knows how many survived – and it’s hard to even estimate. I have been looking everywhere!!!! where did you get them? i mean where do you think i could find them?